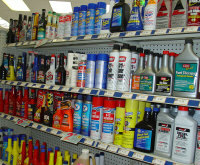 Auto parts stores carry a wide selection of gasoline fuel additives and treatments. Most of these products are formulated to help your engine and fuel system run cleaner for better performance, fuel economy and lower emissions. Some are intended for other purposes, such as octane boosters and lead substitutes for older pre-emission engines that were not designed to run on today's fuels. These preventive maintenance products contain moderate levels of detergents and cleaners to minimize the formation of varnish deposits in fuel injectors, and carbon deposits on intake valves, pistons and combustion chambers. Recommended usage: Add a bottle to your fuel tank every other fill up, or every 1,000 miles. If your engine already has dirty injectors or carbon deposits, you will need a stronger product. All brands of gasoline are required by law to contain a small amount of detergent and cleaner. However, the minimum, level required by law may not be enough to keep your fuel system and engine clean. You can use a fuel system cleaner additive, or you can use a "Top Tier" brand of gasoline that contains higher levels of detergents and cleaners (click HERE for more details about Top Tier gasoline). Dirty fuel injectors are a common problem on late model high mileage engines. Over time, fuel varnish deposits can form in the nozzle area of fuel injectors. Deposits restrict fuel flow, interfere with proper fuel atomization and typically cause the air/fuel mixture to run lean. The result can be engine misfires, poor performance and fuel economy, and increased emissions. Fuel injector cleaners that contain higher levels of detergents and cleaners can often restore injectors to like-new performance. When the product is added to the fuel tank, it flows to the injectors where it loosens, dissolves and washes away the deposits. The cleaning action takes time, but usually after several hundred miles of driving you can feel a noticeable improvement. Recommended usage: Use as needed, or every 3,000 to 6,000 miles. One bottle of product will typically treat 12 to 15 gallons of fuel. NOTE: Short trip urban driving typically causes varnish and carbon deposits to form much more quickly than highway driving. Good products to use: Chevron Techron Fuel System Cleaner, CRC Fuel System cleaner, Gumout Fuel System Cleaner, Valvoline Fuel Injector/Intake Valve Cleaner. If your injectors are really dirty, they may require a second treatment. And if that fails to restore normal operation, the injectors may have to be professionally cleaned with a concentrated solvent. This can be done by feeding pressurized solvent (from a pressure can or tank) directly into the fuel injector supply rail through the service fitting or T-connection. The other alternative is to remove all of the injectors and have them flushed out on a fuel injector cleaning machine. Some injector cleaning machines also have an ultrasonic bath for soaking dirty injectors. If cleaning fails to restore normal injector operation, your injectors will have to be replaced. 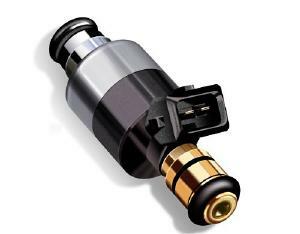 New fuel injectors can cost over $100 each! Some gasoline fuel tank additives that are formulated to clean dirty injectors do not do much to remove combustion chamber deposits. Other products that use a different chemistry can clean your injectors and dirty intake valves, pistons and combustion chambers. IMPORTANT: Always read the labels on fuel additive products to determine which product will best suit your needs. 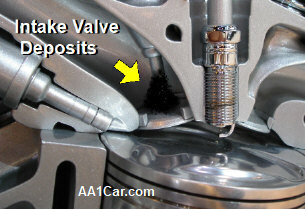 Carbon deposits that build up on the intake valves hinder airflow. This can be a problem on older high mileage engines with worn valve guides and valve seals, as well as newer engines that are only used for short trip driving. One of the symptoms of dirty intake valves is a hesitation or stumble when you step on the accelerator pedal. Dirty intake valves are also a common problem on many late model engines that have Gasoline Direct Injection (GDI). Direct injection sprays fuel into the combustion chambers under extremely high pressure (similar to a diesel engine). This greatly improves fuel atomization for a better, more powerful burn. The fuel spray does not come into direct contact with the inlet or stem side of the intake valves so there is no cleaning action for the valves like there is with port fuel injection. Over time, oil vapor deposits sucked back into intake manifold through the PCV system can build up on the intake valves creating thick carbon deposits that hurt performance, fuel economy and emissions. With Port Fuel Injection (PFI), the injectors spray fuel into the intake ports in the cylinder heads. The fuel spray constantly washes and cleans the intake valves, which reduces deposit formation (assuming the fuel contains adequate levels of detergent and cleaner, or you are using a fuel cleaner supplement regularly). Carbon deposits that form on the tops of the pistons and inside the combustion chamber increase the compression ratio of the engine. The thicker the deposits, the greater the change. This can lead to engine damaging detonation (spark knock). Late model engines have knock sensors that can detect this type of problem. If a knock is heard, the engine computer will momentarily retard ignition timing to alleviate the knocking. But this also reduces performance and fuel economy. If carbon deposits are causing a problem, the solution is to use a strong "Top Cleaner" product that can loosen and remove the hard carbon deposits. Such products are typically sprayed or fed into the intake manifold. The engine is then shut off so the product can soak for a period of time (20 minutes to an hour). When the engine is restarted, the loosened deposits should be blown out with the exhaust. Recommended usage: Use only if carbon build up is a problem. Follow the direction for how the product is to be applied and how long it should be allowed to soak before restarting the engine. NOTE: The oil and filter should also be changed following a de-carbon treatment. Fuel system deicer is a product that has been around for many years, and is still recommended for winter driving. Deicer contains methanol alcohol which absorbs and disperses excess water in the fuel so it can't puddle, freeze and block your fuel supply line. Recommended usage: During extremely cold weather, add a bottle of deicer when you fill your tank. If you have a frozen fuel line and your engine will not start, add two cans of deicer to the fuel tank. Wait a couple of hours and try again. For older vehicles that have a carburetor rather than fuel injectors, fuel varnish deposits and dirt can clog fuel metering jets, outlets and the throttle bores. Cleaners formulated especially for carburetors contain solvents that can loosen both dirt and varnish deposits. Recommended usage: Clean the carburetor yearly, inside and out. Aerosol products can be spray into the throttle bores and on the outside linkages to keep parts moving freely. If internal metering circuits are dirty, some products may be added to the fuel tank, fed directly into the car via a T-connection in the fuel line, or carefully poured into the carburetor fuel bowl through the air vent tubes. Carburetor removal and disassembly may be required if a carburetor is especially dirty. Always follow the directions on the product for best results. Dirty throttle bodies can also affect performance. Aerosol throttle cleaner is a good product for removing varnish deposits from the throttle body and intake manifold. Some intake manifold cleaners are designed to be fed into the manifold through a vacuum port while the engine is running. CAUTION: Some throttle bodies have a special coating in the throttle bores that is supposed to prevent dirt and varnish deposits from sticking to the bores. Make sure the cleaner product you use is approved for the application as a strong solvent may damage the protective coating. Dirty Mass Airflow Sensors can also cause drivability problems and set fuel mixture codes. An aerosol electronics cleaner or MAF sensor cleaner is the only type of product that should be used to clean a dirty MAF sensor. Do NOT use carburetor cleaner, brake cleaner or any other type of cleaner or solvent on a MAF sensor as doing so may damage the sensor or leave a residue that affects sensor accuracy. 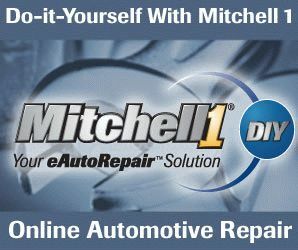 Recommended usage: As needed (Check Engine light on with lean fuel codes or MAF codes), or every 15,000 miles (once a year) for preventive maintenance. If a vehicle is going to be stored for a long period of time (more than a couple of months), the gasoline in the tank may begin to break down. Adding a bottle of Fuel Stabilizer to the tank can prevent this kind of problem from occurring. Fuel stabilizer is also recommended for lawnmowers, motorcycles, ATVs, marine engines, portable and stationary gas-powered generators and other small gasoline engines where the fuel tank may not be drained prior to storage. It can also be used to extend the shelf life of gasoline stored in fuel cans for later use. Recommended usage: Add the product to the fuel tank when the vehicle is stored. Follow the directions on the product for how much to add to the fuel (so many ounces per gallon). The chemicals in the product will usually stabilized the fuel for up to two years when used correctly.